Born in Paris, France, Alex Terrier started playing the piano at age 8, picked up the saxophone at 10, practiced Birds transcriptions by 12 and knew Jazz would lead his path. Since then he has devoted his life to music. 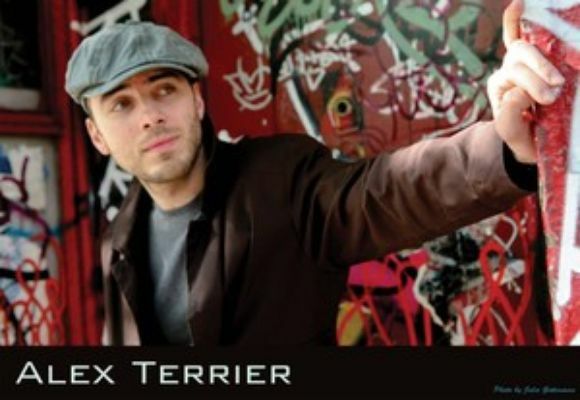 After graduating from the National School of Music of Evry, Alex Terrier won the Lavoisier Scholarship (French Department of Foreign Affairs) and a scholarship from Berklee College to study at the famous college in Boston. Three years and a dual Degree in Performance and Composition later, Alex then moved to New York City. Since the very beginning Alex was interested in composition and he wrote his first melodies on the piano looking at his mother's paintings. He is now a fully accomplished composer and arranger. So Joe Lovano says of his former student. With his academic background Alex has been teaching and giving clinics in USA, Costa Rica, France, Germany, and Portugal. He leads several bands, co-lead a show for children presenting the history of Jazz and will soon co-host a Jazz radio show. Parisian-born, Brooklyn based saxophonist/composer Alex Terrier, recipient of numerous awards on both sides of the pond, announces the release of his second CD as a leader, Roundtrip (available October 6, 2009), featuring Roy Assaf (piano), François Moutin (bass) + Steve Davis (drums), with Akira Ishiguro (guitar-tracks 2 + 5) and Edouard Brenneisen (guitar-tracks 8 + 10). On Roundtrip, an album of all original compositions, Terrier has created a tour-de-force recording where the energy of the New York jazz scene meets the melodic poetry of European music. Terriers earliest days as a musician consisted of performing classical piano pieces. The night he heard live jazz for first time, the Berklee grad decided right then and there to devote his life to music. With Parker, Miles and Coltrane as his early guides to jazz, and the works of Mozart, Beethoven, Schoenberg and Bartok as his first sources of study for composition, Terrier has gone on to developed a highly distinctive and personal voice. Despite the praise received from the likes of Lovano, Liebman, Garzone and others, Terrier is most gratified by the many messages of support he receives from listeners. Roundtrip opens with the burning, up tempo title track with Terrier coming on like a hurricane on the alto saxophone. Terrier explains, This piece is based on a composition by Wayne Shorter. I wanted to write an up-tempo tune, with the energy and sound that are specific to the New York sound. I hope one can hear the strong influence of artists such as Art Blakey, Wayne Shorter and Bobby Watson. For me it truly reflects the excitement of returning to New York City after traveling around the world! (The Mirror of The Disguised Angels), the saxophonist captures the vibe of a famous place in Paris. Terrier fills us in; You can find this mirror in an old bookstore in Paris located in the center by the river. One should go on the second floor to find it. It is used to leave messages to people around the world who have to come to the mirror to read them (an old fashion IM I guess!). I did leave a message and then wrote this piece. I tried to be as lyrical as possible again, and I wanted it to be poetic. It is probably the most European influenced song in its feel and the compositional techniques I've used. , written in the style of one of Terriers heroes, Ornette Coleman. Roundtrip is a powerfully engaging statement from a new voice on the saxophone. One that has grabbed the attention of players that represent the pinnacle of artistry on the instrument, Joe Lovano, Dave Liebman, George Garzone, Jerome Sabbagh and others. Works of art, literature and music are often judged by how much of his/her true self the creator has put into the work. With that criteria, Roundtrip has the great potential to exceed expectations, to delight and to inspire.